I think that a lot of us fall into a rut when picking the decor for our homes. We don't know what color will go best with what furniture and so the easy answer. . . a mirror. So often we walk into homes and see the walls covered in mirrors and the walls are barren of art. An occasional mirror can be a powerful piece, making a room feel larger or accenting a color or creating a feeling, but too much of a good thing can easily go wrong. Our suggestion. . . fill more of your walls with art and use mirrors sparingly. 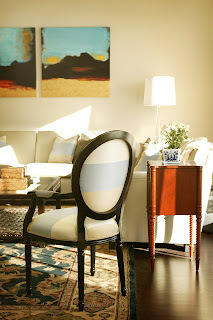 Art adds so much to a room and can bring in so much color and energy to a neutral room. 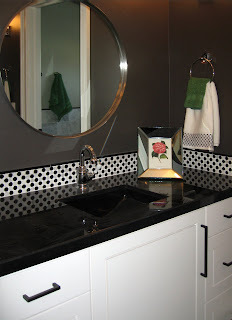 Just a little sneak peak at one of our two 2009 showcase homes located in Millville, Utah. 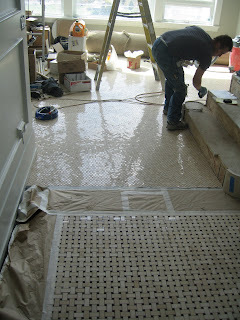 It has been a long time coming from the time we started working on this beautifully tiled home. With imported tile from China we designed each space in the home with a unique tile feature-- from the kitchen and the bathroom floors and backsplashes to the outdoor tile decks and the entertaining stage in the downstairs theater. It is refreshing to walk into this home greeted with an elegant feeling created from the light walls and glistening tile work. The kitchen is our favorite color--white. 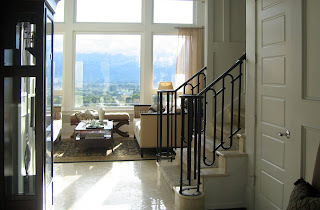 It is so invited with it's clean lines and glass panels, peaking into the treasures behind the cupboards. We love the ceiling detail in the kitchen framing the large polished nickel lights. 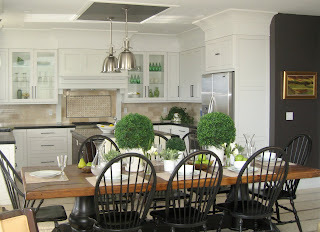 Our blog here at Michele Dunker Interiors is all about design. From the latest and greatest furniture, fabrics and textures to our latest and greatest projects. 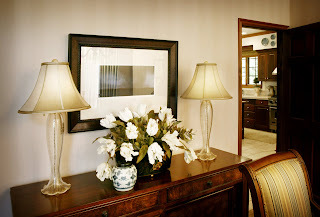 We also will share tips and design advice that we have found to be helpful through out our many years in the industry. We hope that you will enjoy our stories and find a passion for good design.